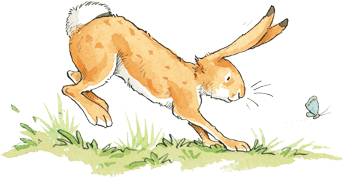 Download these activities to keep your little hares busy! Draw a line to match up the Nutbrown Hares! Print your own hare headband design to make a pair of hare ears for your little ones. "I love you as much as..." Get creative and draw what you love someone as much as, then colour it in! Do you love someone right up to the moon? And back? Invite them to celebrate with these invitations. Little Nutbrown Hare shows how much he loves Big Nutbrown Hare in many ways. Finish the picture to ﬁnd out which way he is doing here. Unscramble the words to read a secret message from Big Nutbrown Hare to Little Nutbrown Hare. Oh no! Little Nutbrown Hare has hopped so many times that he can’t see Big Nutbrown Hare any longer. Can you help him ﬁnd Big Nutbrown Hare?